A couple working at home, together, need not be an idle dream. One or the other of you may have already been established in a home office, but then maybe a change in employment conditions means that you are both now in need of some sort of home office. If the existing space isn’t large enough for the both of you, then having two separate offices may be the best solution. In my home we have two and a half offices and there’s only two of us! Inevitably both of you will use a home office to varying degrees. 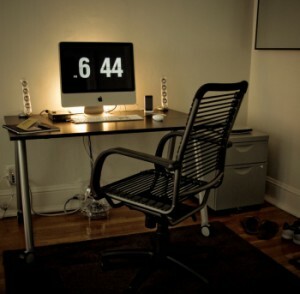 What’s important is having a home office set up which works, so that you can both flourish and prosper in your endeavors, be they work, pleasure or both. Do you have enough money in the joint checking account for a few pieces of home office equipment and furniture? See how much extra you can squeeze from it, then sit down and write out exactly what ‘s needed for the supplies and equipment. Together, you can always cut down on the expenses such as eating out a lot or that extra large cappuccino in the morning, or a few visits to the outlet stores or golf course. If you use the dry cleaners then reduce that cost by wearing washable clothing. Once you’ve determined what your budget is for a home office upgrade, you can then set the priorities for purchase. Are you setting up two offices or just one? If one, then that alone will cut down on the expenses. The top priority is an office desk big enough for the two of you as well as two comfortable office chairs. An office chair simply cannot be shared as the settings and seat and height etc. are so individualized. If you get a simple rectangular home office desk and put shelving up on the wall, then you can sit on either side of the desk and save money on this crucial piece of office furniture. Alternately, if your home office is long and narrow, then place a desk along one wall where two of you can sit (with lots of elbow room). Computers for both of you are next, and if they are hooked up to a LAN (local area network) you can save money on an all-in-one printer/scanner/copier by both using it at will. Make sure it’s wireless and you won’t end up strangling each other with cords as you rush to answer that call from a new client. Always discuss purchases with each other, by the way, so you won’t duplicate them, and one of you may think of a cheaper store to buy that case of paper from, for instance. Buy a two-phone (at least) portable system. Each of you can place your handset close by you and the base unit may remain in the center of your desk area, thereby giving you each enough space to grab that file from your desk drawer while still holding into the phone. Even if you have one Internet account, always have at least two separate email addresses. Having one server saves you money but everyone needs an email account so that clients may communicate with them directly. Gmail is a good choice for this because you can set up accounts for free and the capacity is virtually unlimited. If you need a website and your spouse has a completely opposite product or service to sell or offer, then think about two sites unless you simply cannot afford it. If you are sharing your office it’s great to have low-volume music playing if you both like that sort of thing, as well as the same genre of music to create a nice ambiance. Lighting is also important, this also sets the tone. But be sure to think practical here and make sure there’s lots of light in the office where needed. Just enough will make for a creative and productive atmosphere. My own personal choice is for a good desk lamp and then either wall lights or a central ceiling light. Remember to save money on electricity by using eco-friendly light bulbs in your lamps. There are many kinds now and you may have your pick. Be polite and encouraging to your spouse working alongside of you in the home office. Don’t underestimate the tensions that can be caused by living and working together. You might think sharing a home office will save you money but if having separate offices saves your marriage…….set up multiple home offices like me! Lloyd Burrell enjoys writing reviews on home office desk furniture. Lloyd lives on the West Coast of France with his wife and two children.